Steven Alvarez joined the English department in Spring 2017, as assistant professor of English and Coordinator of the First-Year Writing Program. He specializes in literacy studies and bilingual education with a focus on Mexican immigrant communities. 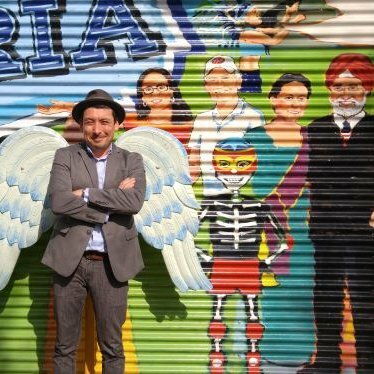 He teaches courses ranging from autobiographical writing, ethnographic methods, visual rhetoric, and “taco literacy,” a course exploring the foodways of Mexican immigrants in the United States. His monograph Brokering Tareas: Mexican Immigrant Families Translanguaging Homework Literacies (State University of New York Press, 2017) is an ethnographic study about how learning English transformed family relations and structured educational ambitions within a specific Spanish-dominant urban immigrant mentoring program in New York City. The program cultivated a sense of community and academic participation closely allied to ethnic identity, encouraging a sense of value for bilingualism as a political tool for—and the everyday reality of—immigrant families. His second book Community Literacies en Confianza: Learning From Bilingual After-School Programs (National Council of Teachers of English, 2017) explores two bilingual K-12 after-school programs and how to connect educators with communities in meaningful and reciprocal ways. This community literacy research builds on his research in New York City with research in Kentucky and explores the ways teachers can build relationships with emergent bilingual communities outside of school settings.